The term "pit bull" is not a breed: Historically, it was an informal and slang term that was used to describe any dog that was used for the cruel sport of bull-baiting - using dogs (of any breed) to seize tethered animals such as bulls within an enclosed area called a "pit" (hence the term "pit bull"). While many different breeds and mixes were used for this sport, dogs that resemble today's bully breeds were commonly used - it was not an activity limited to today's "pitbull-type" breeds. In other words, "pit bull" was more of a term used to describe any dog that was used for bull-baiting and less of a term used to describe a specific breed or type of dog (technically, if a Husky had been used for baiting a bull in a "pit" it would have been considered a "pit bull" back then). Furthermore, baiting is not an inherent trait for any breed, it's an activity that must be taught and honed, no different than training a dog to sit or fetch. Today, the term "pit bull" is a generic term used to loosely describe a type (or category) of dog based only on its physical appearance (not on genetics or lineage) resembling any medium-sized dog with physical traits from any of the numerous "bully-type" (or bulldog-type) breeds. While the American Pit Bull Terrier (APBT) is the only formal breed with the term "pit bull" in its name, over 20 unique breeds and even more mixed breeds share the same or similar physical characteristics that are common to dogs in the "pitbull-type" category. In fact, a recent comprehensive peer-reviewed canine DNA study determined that 98% of dogs visually identified as "pitbull-type" dogs are in fact mixed breed dogs (not purebred); additionally, the majority of the "pitbull-type" dogs in the study had less than 50% DNA from any "pitbull-type" ancestry (from any of the "pitbull-type" breeds identified below). The history of pitbull-type dogs: Pitbull-type dogs are a crossbreed between a bulldog and a terrier originally bred in England in the early 19th century (then called "Bull and Terriers") to be working dogs on farms to herd, protect, and manage livestock. While their early history is complex and includes herding cattle and protecting homesteads, it also unfortunately includes the cruel sports of bull-baiting and dog fighting. However, these cruel "sports" were not specific to today's pitbull-type breeds - many different breeds were subjected to these activities which are now illegal almost everywhere. During the 20th century, pitbull-type dogs quickly became one of America's most popular family dogs to the extent that they became national mascots and were used on recruitment posters for World Wars 1 & 2 and were proudly called "America's dog". More recently, their popularity has continued to grow to an estimated 20% of the total dog population in the U.S. (all "pitbull-type" dogs and mixes combined) and are successful as service dogs, therapy dogs, K9 police dogs, as family pets, and consistently achieve excellent temperament scores. 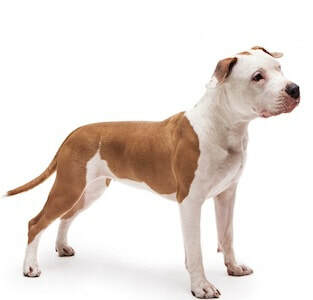 ​The American Pit Bull Terrier (APBT) is the tallest and most athletic of the four pitbull-type breeds. The American Staffordshire Terrier is slightly shorter and stockier than the APBT. 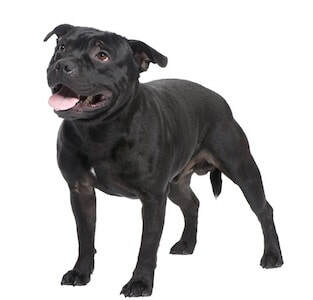 The Staffordshire Bull Terrier is easily the smallest of the four. 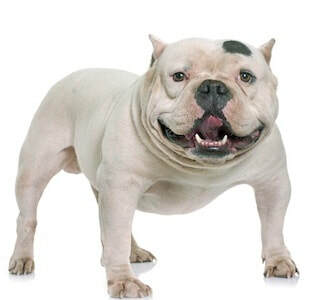 The American Bully is the most unique of the group as it's the most stout and closely resembles the classic Bulldog breed. 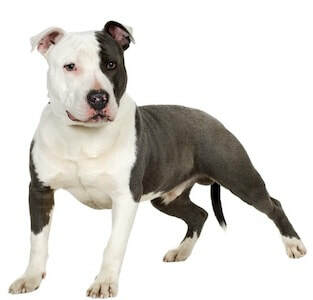 Our Breeds & Pictures page has more pictures and information about the pitbull-type breeds. The fact is that there is no such thing as a "pit bull" - it is the equivalent of a unicorn in the world of canine DNA. While the four breeds listed above do actually exist and have achieved excellent temperament scores making them outstanding canine citizens, the majority of "pitbull-type" dogs are in fact mixed breed dogs. However, we believe that a dog's "breed" label is for the most part irrelevant - whether a dog is labeled a "pitbull", an "American Pit Bull Terrier", a "Bully", or simply a "mixed breed dog" really doesn't matter because of the fact that all dogs are individuals so we'd argue that there is really only one accurate label for our "pitbull-type" family members - and that label is: "a great dog".